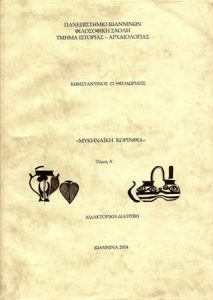 The current thesis attempts to present for the first time systematically and analytically the Mycenaean presence in Corinthia, as reflected through bibliographical references, new information, all known publications, the latest research, as well as personal observations and autopsies. It has tried to study in detail the available unpublished Mycenaean material (architectural, burial, findings) from old excavated – yet unknown to the archaeological community – sites, as well as to review and renegotiate the older material from the published sites. Based on these elements, a synthesis of all hitherto known data on Mycenaean Corinthia has been attempted, providing in parallel the necessary comparisons, comments, changes, issues and concerns, wherever this has been possible. Through this approach, the ultimate goal of this thesis is to lay the groundwork for a more rational approach of the past of Corinth during the Mycenaean period, but at the same time to contribute to the region’s archaeological assessment, placing Corinthia in the actual position in hierarchy that it held in the Mycenaean world.